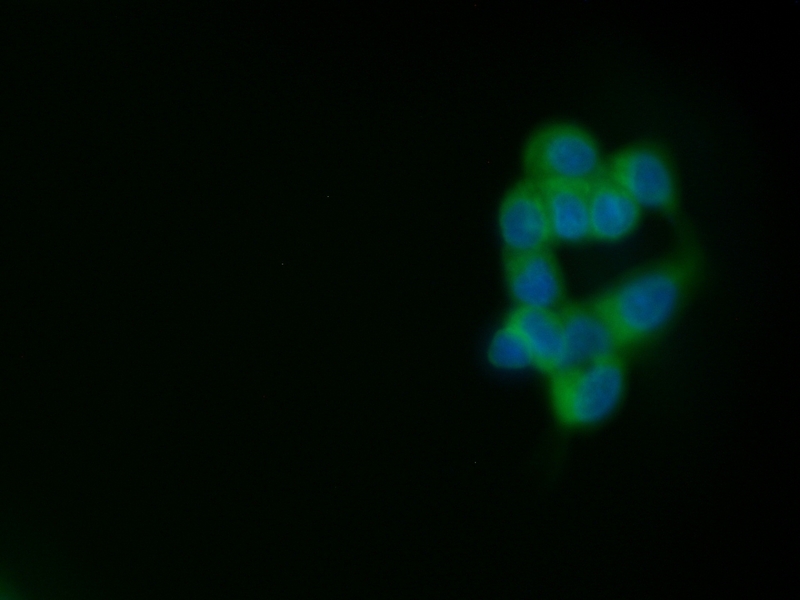 Immunofluorescence staining of MCF-7 cells with Mouse anti Human CD227:FITC (MCA1742F) (green), nuclei are counterstained with DAPI (blue). Sandwich ELISA analysis of CD227 expression using Mouse anti Human CD227, clone C595 (MCA1742) as a capture reagent and biotinylated Mouse anti Human CD227, clone 6A4 (BioRad Catalog 22508250) as a detection reagent with purified breast cancer antigen (BioRad Catalog 22502313) as antigen for the generation of the standard curve. Detection is by HRP conjugated streptavidin and substrate. Microtitre plate is read at O.D. 450 nm on the Bio-Rad iMark Microplate Absorbance Reader (Bio-Rad Catalog 168-1135). Plasma and serum samples diluted 1:5 are indicated in green and orange respectively. Mouse anti Human CD227 antibody, clone C595 (NCRC48) recognizes CD227, also known as mucin 1 which is a breast cancer associated mucin encoded by the Muc-1 gene. Mucins are a family of high molecular weight, heavily glycosylated proteins (glycoconjugates) produced by many epithelial tissues in vertebrates. CD227 is expressed on most secretory epithelium, including mammary gland and some hematopoietic cells. This protein is overexpressed abundantly in >90% breast carcinomas and metastases. 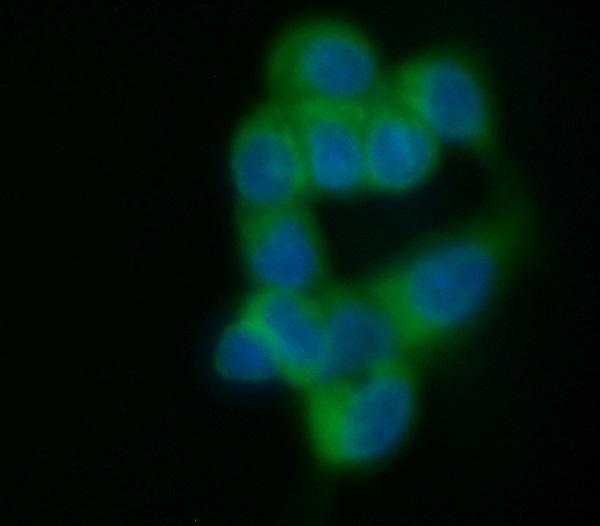 Mouse anti Human CD227 antibody, clone C595 recognizes the peptide epitope ARG-PRO-ALA-PRO within the protein core of the mucin. 1This product requires heat mediated antigen retrieval prior to staining of paraffin embedded material. Citrate buffer pH6.0 is recommended for this purpose. Price, M.R. et al. (1990) Immunological and structural features of the protein core of human polymorphic epithelial mucin. Mol Immunol. 27 (8): 795-802. Price, M.R. et al. (1990) C595--a monoclonal antibody against the protein core of human urinary epithelial mucin commonly expressed in breast carcinomas. Br J Cancer. 61 (5): 681-6. Price, M.R. et al. (1991) Purification of anti-epithelial mucin monoclonal antibodies by epitope affinity chromatography. J Immunol Methods. 139 (1): 83-90. Denton, G. et al. (1995) Primary sequence determination and molecular modelling of the variable region of an antiMUC1 mucin monoclonal antibody. Eur J Cancer. 31A (2): 214-21. Denton, G. et al. (1997) Production and characterization of a recombinant anti-MUC1 scFv reactive with human carcinomas. Br J Cancer. 76 (5): 614-21. Murray, A. et al (2001) Production and characterization of 188Re-C595 antibody for radioimmunotherapy of transitional cell bladder cancer. J Nucl Med. 42: 726-32. Hisatsune, A. et al. (2011) Anti-MUC1 antibody inhibits EGF receptor signaling in cancer cells. Biochem Biophys Res Commun. 405: 377-81. Ragupathi, G. et al. (2005) Antibodies against tumor cell glycolipids and proteins, but not mucins, mediate complement-dependent cytotoxicity. Huang, D.M. et al. (2004) Modulation of anti-adhesion molecule MUC-1 is associated with arctiin-induced growth inhibition in PC-3 cells. Prostate. 2004 May 15;59(3): 260-7.